For a model to be effective in helping a client make better decisions, the client has to trust that it is a good representation of the problem -- the way the decisions, assumptions, and uncertainties affect the objectives that they care about. It is therefore important that the model be transparent -- that the modeler and others, including the client, can understand the essential structure and assumptions, so that they can develop confidence in the results. Influence diagrams were developed specifically to support communication between modeler and client. They provide an intuitive visual display, to help create, navigate, explore, and communicate models. 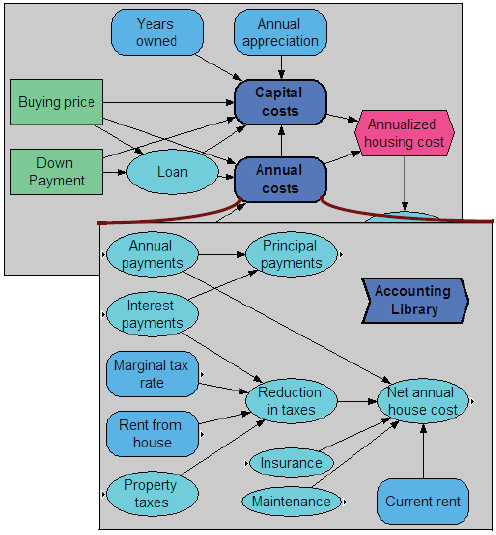 Unlike diagrams sometimes used to design or document spreadsheets or programs in R, Python, and other languages, Analytica's influence diagrams are a key aspect of the computer representation. The node types and influence arrows are guaranteed to reflect the underlying quantitative structure. You can draw a model as a lucid influence diagram to display its essential qualitative structure, uncluttered by quantitative details. 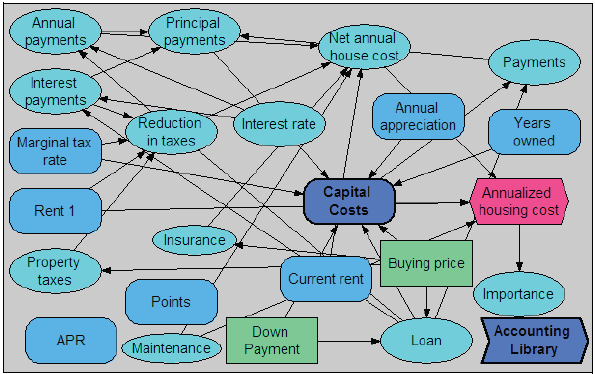 You can organize a complex model into a hierarchy of such modules, with each diagram showing part of the model in a simple comprehensible form. But, it's still possible to create impenetrable spaghetti! These pages offer tips for creating lucid diagrams and module structures to make sure that your models are truly transparent. Key guidelines including how to size and arrange nodes, organize module hierarchies, and the judicious use of color. Options include which arrows to show, node sizes, colors, text size, and font family.